Ralph Jay Stolow passed away April 12, 2012 in his apartment in Denver, Colorado and unfortunately not found by his friends until a week after his death as a result of the IRS having the heartlessness to schedule tax day coincident with his departure from this earth. His death preceded a local glut in whiskey and asthma inhaler inventory for the Denver area. Speculation has run amok concerning the cause of Ralph’s demise, but a search of his apartment revealed that he was compiling a book containing his funny stories and anecdotes and he most likely died laughing with a scotch in his hand, unable to catch his breath. Ralph was the second of four boys born to Eugene Franco and Sylvia Anna Stolow. His insufferable older brother Lawrence, his charming younger brothers Matthew and Joshua, and numerous precocious nieces and nephews survive him. Ralph’s father Eugene sold Israeli war bonds in the Metroplex and his mother was a doting Jewish housewife who looked very much like George Costanza’s mother on Seinfeld. She was the inspiration for the role of Walowitz’s mother on The Big Bang Theory. Growing up, Ralph was bullied by his older dimwitted brother Larry and resorted to humor to try to deflect abuse from himself and his younger brothers. Larry was the large type who liked to Lord it over them and physically Ralph could not out arm-wrestle Tiny Tim. Ralph was a hero to his younger brothers who viewed him as their protector. 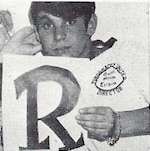 Ralph was a graduate of Hillcrest High Class of 1968, but was adopted by the Punography, Ltd. initial members as the only non-RHS 1969 classmate in recognition of his humorous contributions and his winning personality. Ralph began his career working for Holiday Inn Central in Dallas on Central Expressway just south of Fitzhugh Avenue. Ralph was the Bell Captain and sometimes Desk Clerk and was well known by many patrons such as the Dallas Cowboy Football Team, Darrell Royal and the Texas Longhorn Football Team, Clint Peoples (Legendary Texas Ranger), countless bands, celebrities and famous politicians. When they called for reservations, many asked for Ralph, as they knew he would take care of them when hotel management would not. He also worked for Ramada Convention Center, Downtown Dallas. He was a frequent patron of the Dallas bar scene in the 1970’s and had the distinction of picking up fewer women per attempt than Richard Simmons. One of the fondest memories of Ralph was he and friends eating late night after drinking hard for hours. Ralph knew every late night waitress in town by first name and they remembered him because he was always a big tipper. One night at the Oasis on Greenville a friend (I shall remain nameless) came back from the bathroom to find Ralph passed out face down in his enchiladas. The waitress and the friend were able to carry Ralph to the car. Ralph brought the art of Bell Captaining to a fine art. He was different things to different people. To businessmen looking for a little extracurricular activity Ralph provided women companions and a vast knowledge of the clip joint scene. Both the guest and the establishment he deposited them in would pay him. Ralph hired off duty housekeepers to launder shirts and place them in cellophane bags and could get laundry done in less than an hour, 24 hours a day. He knew every late night eating establishment and personally delivered their food to the hotel at all hours at a marked up price. Ralph had a volume discount arrangement with the liquor store and kept a full inventory in the trunk of his car. The sale price of booze went up 300% after hours. To little old lady travelers, Ralph was the college kid trying to work himself through school. Fortunately, Ralph looked young for his age and ran this scam into his thirties. He also used the hotel courtesy car as a cab service, with the famous line “Cab fare from the airport is $12.00. How about I drop everything and come get you for $8.00?” Ralph ran a lively ticket scalping business during big games, always asked folks if they had an extra ticket, and then sold them at market prices when other fans needed them. When training with Ralph, the other bellmen marveled at his methods. He would take a guest to a room and never quit talking till the money hit his palm. Sometimes that meant adjusting the drapes, fine tuning the TV, checking for wall outlets for their mobile appliances, counting the towels, explaining the room service menu, the safety exit routes, checking for burned out light bulbs, tightening the sheets on the bed, wiping imagined dust off the furniture, numbering the soaps and shampoos, explaining the hotel history, its famous patrons, reciting distances to shopping and amusements, telling jokes and funny stories, etc. If you had planned to stiff the bellman, you finally reached in your pocket just to get rid of him. In the years other bellman worked with Ralph they always compared tips at the end of the night. No one ever once beat Ralph no matter how hard they tried. It could be marked up to pride. No one could grovel as well as Ralph. One of the most enjoyable things ever was chasing girls with Ralph. Chasing girls with Ralph was so much more fun – listening to his jokes and stories – than chasing girls with other guys and actually catching them. Ralph had a 1965 Corvette and one of his friends had a 1961 Mercedes convertible. Ralph used to say, “Are we gonna take the Corvette or go slumming in the Mercedes convertible tonight?” Ralph chased girls on Forest Lane, Church and Audelia Road, South Buckner Boulevard, Hampton and Kiest, and Belt Line and Highway 80 in Irving. He was only successful one time. Cruising towards Buckner from Downtown with a friend he decided to pull off on Winslow Avenue to find a bathroom. He wound up in an area of small houses and on the porch of the third house were the two most beautiful Hispanic girls one ever saw, Yolanda and Diane. He called them to the street to ask for directions and both he and his friend fell in love. He asked if they would like to go for a ride and they were eager. He ran by the liquor store for Boone’s Farm and called in a favor from a friend who wasn’t home in East Dallas and used the key under his mat to get in. Things were going great and the girls were getting drunk and then the conversation came around to ages. The girls said they were fifteen. Ralph and his friend looked at each other in a moment of panic, and the friend got the car started while Ralph helped them to the door. A moving delivery of the girls was made at the corner of Winslow and I-20 going 15 mph. Taking trips with Ralph was an adventure, too. Friends went trout fishing and skiing with him in the Rockies and drove to Las Vegas to gamble with him. During one fishing trip with Ralph on Spring Creek near Altmont, Colorado, Ralph put on an expensive baby blue suede jacket to go fishing. His friend tried to talk him out of it, but he insisted. While fishing a fast water pool near where a tree had fallen across the creek creating a sort of bridge, Ralph decided the fishing looked better on the other side of the creek and proceeded to cross, walking the trunk and trying to avoid the branches. He lost his balance and fell in upstream of the tree and was swept up under it by the current, snagging on the branches under the water. When he did not surface, his friend stripped to his underwear and started to jump in to retrieve him when he popped up sputtering for air just below the tree. The friend remarked that he saw Ralph’s life pass before his eyes that day. The baby blue suede coat after shrinking was given to a six year old. It was only slightly too small for him. Coming back from Las Vegas, Ralph and a friend had a cooler with wine for Ralph and malt liquor for the traveling companion. On the way through the Navajo Indian Reservation, they cruised around a pueblo town noting some cute Indian girls. He and his companion headed out of town after their brave (sic) boyfriends showed up with braids, vests and jeans and stared the scalps loose on the city boys’ Sebring cuts. They left town going about 90 miles an hour and both were taking a stiff drink to celebrate their escape. Suddenly they noticed the Tribal Police behind them accelerating with their lights flashing. The friend said, “Oh crap, Ralph. What are we going to tell them for the reason we’re speeding?” Ralph said, “I am going to say ‘What did you expect us to do, two white men being chased by armed hostiles in Indian Territory?’” The Tribal Police went around them and continued up the road as if they were not breaking any laws. Apparently speeding drunks on the reservation were not that rare a thing. Ralph moved to the Rockies for his breathing much like Doc Holiday. Ralph really loved people, so he began working in the medical profession in whatever capacity he could, most often as a male nurse. He never had any children, but doted on his nieces and nephews. He and a friend split a condo at Keystone with a hot tub. The friend brought his twin girls and Ralph brought his brother Josh’s kids. He loved kids and the friend’s girls still remember him fondly. Ralph participated in some avant-garde medical clinical trials and was employed as a contraceptive device tester for many years, because his drinking had rendered him sterile and he helped boost their effectiveness percentages. Ralph and friends also visited Disneyworld with the kids and stayed with his mother and visited the beach at West Palm Beach, Florida. His mother babysat while the Ralph and the friend took an overnight junket to drink and gamble in the Bahamas. Ralph passed with only few expressed regrets – that bars now sold shots for what bottle prices used to be, that he did not see his friends often enough, and that he never got to finish that plate of enchiladas. All the Punography Ltd. Directors and his other close friends in our class will truly miss Ralph. It is obvious that Ralph is in Heaven because, if God had sent him to Hell, it would have been too much fun to be considered punishment for the bad guys and evildoers.